This medium to large sized goggle is the other white meat... 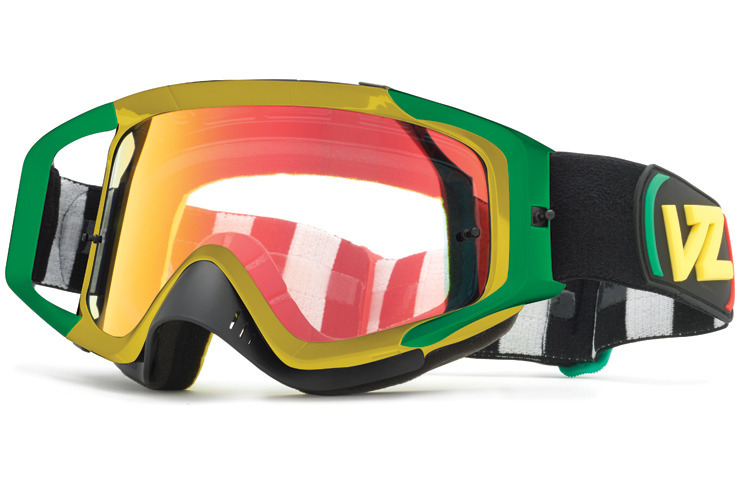 This is the goggle that will bring home the bacon and fry it up in a pan. Thermo-polyurethane frame remains flexible in even the coldest conditions. Anti-fog coated cylindrical lens for crystal clear vision. Wide peripheral vision 100% UV protection. Extended outriggers for a perfect fit without frame distortion. Integrated 3rd tearoff pin clip. Detachable roost. Guard moisture wicking, fleece lined, quad density, oversized face foam. Dual-adjustable, silicone lined strap. Distraction free clear tear off posts. By far the best quality and fit of any brand !! Highly recommended for moto . I love these goggles. They fit great with my fox helmet and the tinted lense is perfect on a sunny day. A clear lense also comes with them. I bought these for Motocross and wore them today for the first time. I love the lense they came with as it was a sunny day but it also came with a clear one. These are so comfortable and fit really well with my Fox helmet. I also have a couple other styles, but will be upgrading to a few more of this model. Also love the color. Awesome Fit it has a great seal around your face without pinching your nose. love the outrigger system and the lenses has great clarity without any distortion to your vision. And as always looks flat out sick! I've taken and worn these goggles on some of the most moist and muddy terrain I know of, so far these have been the overall best performing goggles I have ever put on. Proven with style !! !